मैंने हर रोज जमाने को रंग बदलते देखा है , उम्र के साथ जिंदगी को , ढंग बदलते देखा है !! वो, जो चलते थे - तो शेर के चलने का , होता था गुमान , उनको भी पाँव उठाने के लिये सहारे को तरसते देखा है !! जिनकी नजरों की चमक देख , सहम जाते थे लोग , उन्हीं नजरों को बरसात की तरह , रोते देखा है !! जिनके हाथों के जरा से इशारे से , टूट जाते थे पत्थर , उन्हीं हाथों को पत्तों की तरह , थर थर काँपते देखा है .. !! जिनकी आवाज़ से,कभी बिजली के कड़कने का, होता था भरम, उनकेहोठों पर भी जबरन,चुप्पी का ताला लगा देखा है .. !! ये जवानी , ये ताकत ,ये दौलत ,सब कुदरत की इनायत है , इनके रहते हुएभी इंसान को बेजान हुआ देखा है ... !! अपने आज पर , इतना ना इतराना मेरे यारों , वक्त की धारा में अच्छेअच्छों को , मजबूर हुआ देखा है .. !!! You all must be surprised that what is my purpose of sharing the above poetry here ???? But I must tell you that some creativity resemble the true fact about Life & if we are able to get the true message from it and also adopt it in our lives then nothing can be much better then this . My heart felt Thanks to the poet of the poetry above . 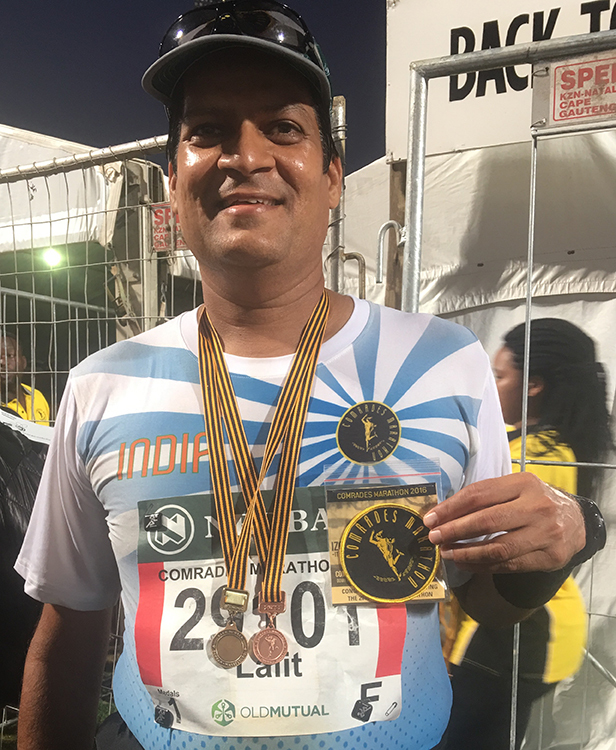 Without taking much time of you all would like to share my experience of My Second Comrades Marathon as people say that I write very lengthy & in full detail . 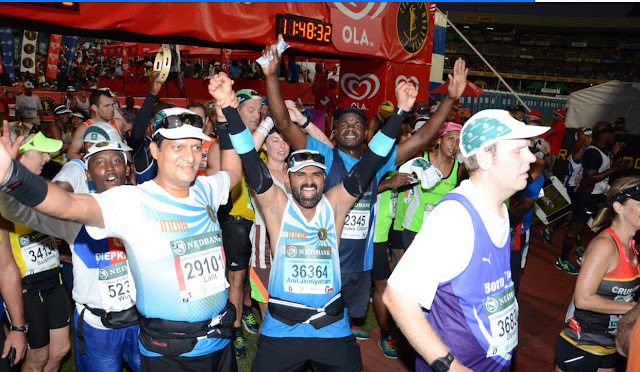 But my dear friends when the run itself is of 12 Hours , plus the preparation for the run , where we have given several hours of training , travelling from Surat to Durban , then again travelling to reach the start point & after the 12 Hours the feeling , so how can I just sumup in short . Either I should also write one or two paragraphs with vote of Thanks & complete it . But my purpose of sharing has always been to inspire people to adopt this beautiful sport called RUNNING . Running is a sport which I love at it’s best . Although as many of you know that I had started running long distance after Surat Night Marathon 2014 ( Half Marathon ) but had never thought that will be running a Full Marathon so how can I think of running an Ultra !!!! ( This also I came to know after long time that what is an ULTRA ? ) But the whole scenario changed or should say that My Life has changed after running & participating in the Surat Night Marathon , 2014 . In our lives if we look back , we see that when we were child then we had an innocent friend circle , then again it has been changing from our schooling days, to our college life , then to our professional lives and till present . Very few friends continue to remain till the end of our lives or can say from start to present . If anyone has so I would regard him one of the luckiest person as having thousands of friends but having the same friend for many years is the biggest asset . Such is also in the case of our relatives – Relatives are same but with time the warmth in the relation changes . I don’t know about you all but it is my personal experience which has taught me to remain calm in every situation ( or in Hindi we can say “ सम की स्थिति “ ) . If there is a favorable situation I never get too excited & if it is not a favorable one then also not too depressed . I always try to live in present . Whatever happens is for good. 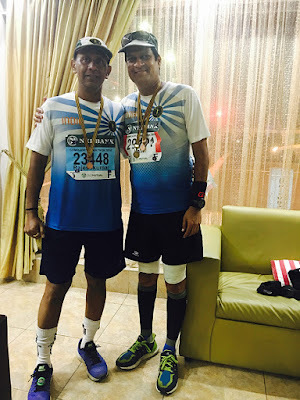 I still remember that after Surat Night Marathon in February 2014 , when I had focused to run a Full Marathon without any guidance & was practicing for it then many of my near & dear ones were continuously telling me to run less as it was not advisable . The culture of our Surat City at that time was to run 15 or 16 km in practice for a Half Marathon & 32 to 35 km for a Full Marathon in practice . I was never a very bright student in my schooling days but as I grew up & entered into my professional life the total concept & approach towards it changed into a practical one . I always remember the story of Shri Vivekanand which I would like to share here . In an exam there was written, answer any six questions out of the ten questions . Vivekanandji wrote the answers of all the questions & wrote “ Check any six ” . Such should be the confidence in doing any work . It was on 11th July 2014 when I ran my first Full Marathon in practice , then the second on 13th July & then again the third on 15th July ( It was all Alone as at that time I used to run all alone ) . My concept is clear that to appear for a paper of 100 marks , the preparation should be of 110 to 120 marks so it will be easy to score during your exam . Such is also in the case of running long distances or any other thing which we do in our lives. 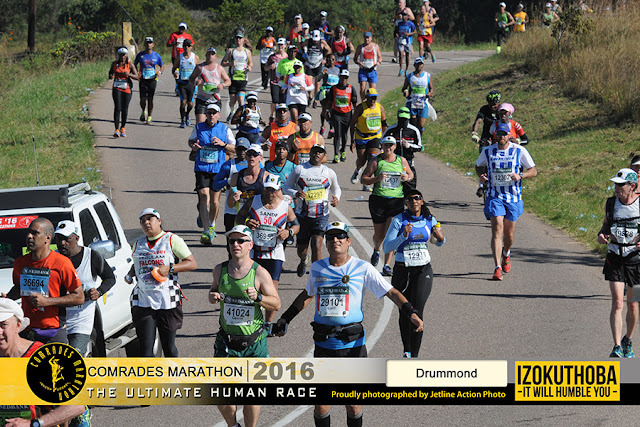 If we start running 21 to 25 km then 21 km becomes easy & for 42 km try running 42 to 45 km . 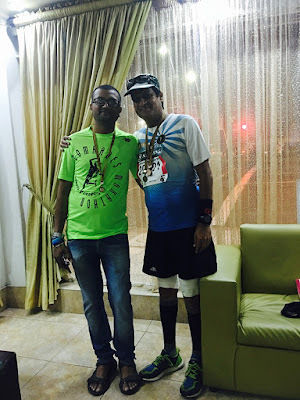 On 16th November 2014 ran my 50 km Run in practice & in this also was perhaps the first one to do so in Surat , in practice . Just like in exams if we prepare for only 80% then for rest 20% we in need of help or just try to reply vaguely , such is also in case of running as when the preparation is only of 15 to 16 km or 32 to 35 km then it becomes very tough to cover those last km & gives us a feeling it to be a herculean task . Many of you with such type of preparation must have gone through this or should say still facing this type of problem. I had been running in capris & cotton or hosiery t-shirts but adopted dry fit t-shirts , shorts after I came to know the benefits of these while running . I am Thankful to those friends who had given me the right advice at that time , as before that I had many times faced the problem of rashes on body . Had I not adopted this then it would have been nearly impossible to run for such long hours . I have to share here some glimpses of my finishing Comrades 2015 as without the glimpses of the last year my attempting it for the second year in succession , it would be impossible to carry forward to my this attempt of Comrades 2016 . 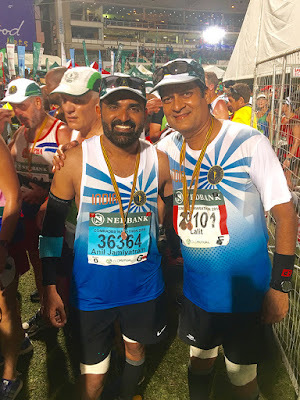 Still remember one more episode that I was attending a party before I was to go for Comrades 2015 then a friend of mine introduced to an already known renowned businessman from Surat . When that friend told him that I was going for a 87 km run the intelligent renowned businessman told “ आपने अपना Insurance वगैरह तो करवा लिया है ना ? 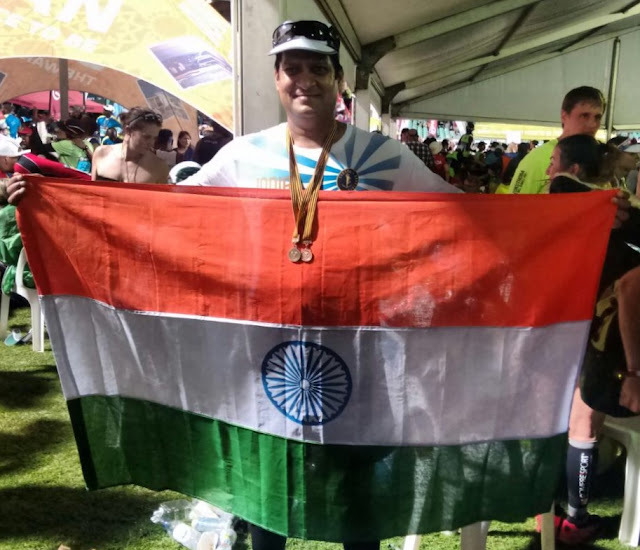 क्या पता आप वहाँ से वापस आओ या न आओ | “ Although I was going alone but I accepted it as a challenge which helped me to cross the finish line & when I came back & when we met he Congratulated me & I told him “ मैं सही सलामत आ गया हूँ और मुझे Insurance की भी ज़रुरत नहीं पड़ी | “ He was in no position to reply back & arrogancy was at it’s best , as nor did he say that ,” He was sorry for whatever he said .” Nothing can be done as mostly people are like this only & they will never be sorry for their mistakes . My purpose of sharing here is , that people will just make fun of whatever you do as they themselves are not in a position to do so . So never get depressed or demotivated . Always try to build a fort ( not only house ) from the stones which people throw at you. From a Half Marathoner to a Full Marathoner, then finishing a Comrades within 15 months since I started running long distance was really amazing & unbelievable, and for me it was just like a dream which I had never dreamt of . 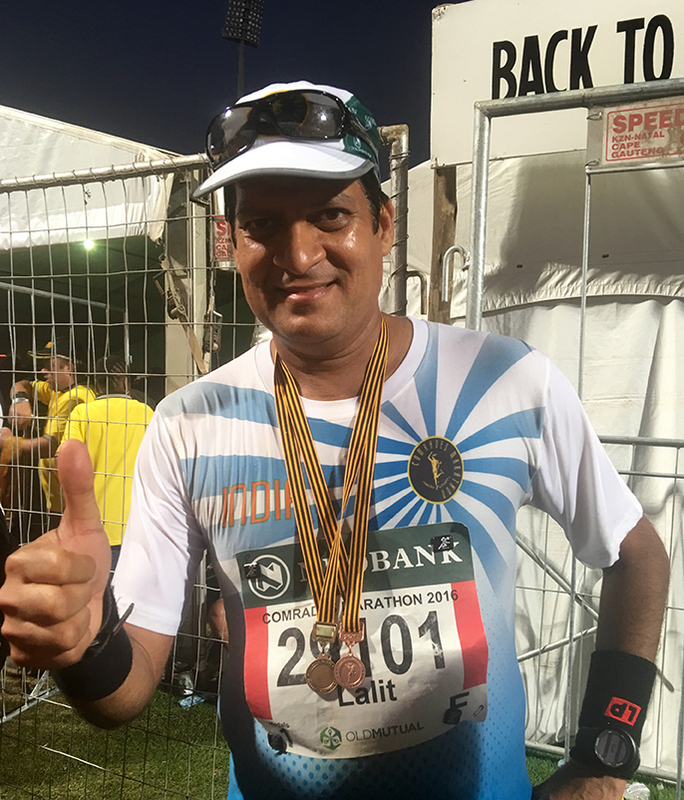 For Comrades 2015 Shri Kalpeshbhai Jain had inspired me to register for it & am indeed Thankful to him as he had shown me a path which I had never ever thought of !!!! . I must say that I will always be Thankful to Shri Kalpeshbhai for guiding me to do Comrades . 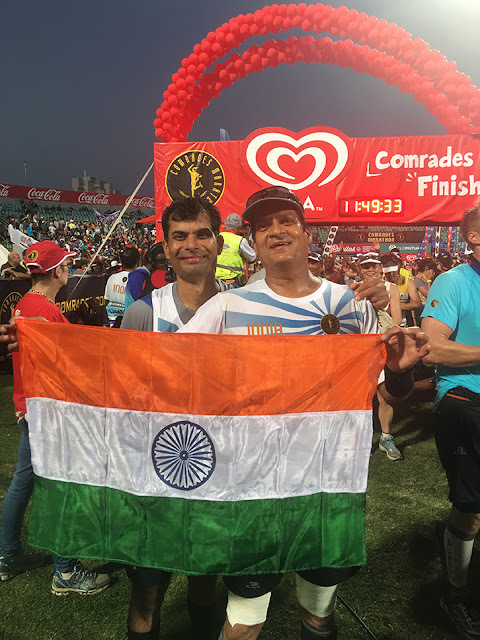 He himself has been registering for Comrades since last three years but due to some unavoidable circumstances has not been able to take a start for it . My wish is that we run Comrades together in the near future & at the earliest . After I finished last year & came back there was a felicitation program kept on the farm house of Shri Amitbhai Gajjar where several runner friends were present . 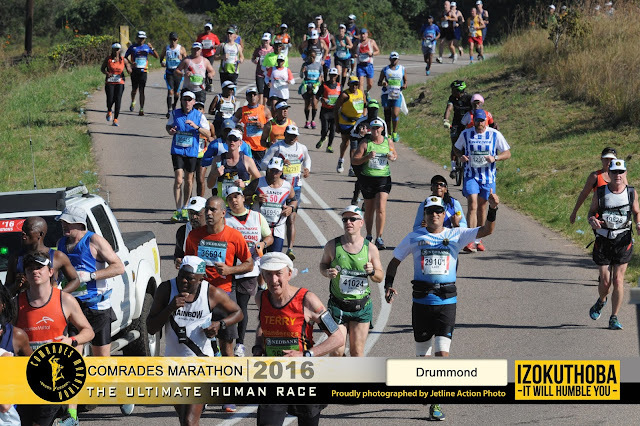 I had shared my experience of Comrades 2015 . People were very much inspired that when a person like me can do a Comrades then they too can . I had told one thing repeatedly that don't go all alone but take along your running buddy with you so that you don't feel lonely not only during the Comrades RUN but in practice runs , travel & stay for Comrades . Last year also I had the greatest opportunity of having the true guidance of how to Run at Comrades from one of the greatest Comrades runner from India - Shri Satishbhai Gujaran ( Now 7 times Comrades Bronze Medalist since last 7 years in succession ) . This year too we were grateful that we had the opportunity and have trained under his guidance . He is such a humble person who came all the way from Mumbai to train us & ran 65 km with us sharing his experience which were very useful for all of us at Comrades . Shri Satishbhai Gujaran had already made our arrangements of a 15 seater Bus which was to take us from Durban Airport to Hotel , to Start point at Peitermaritzberg & return back to Durban Airport . Myself , Sarveshbhai Gupta , Rajivebhai Valadra, Dhruvbhai Trivedi, Nipunbhai Jindal , Anilbhai Mandviwala , Deepakbhai Mundra , Sureshbhai Dakhara , Ashishbhai Kapadiya & Rajivbhai Sheth had practiced together several times for Comrades whether it was on Flat Road , Flyover Repeats or Dudhani practice runs. So everyone was familiar with each other’s form , strength & weaknesses . 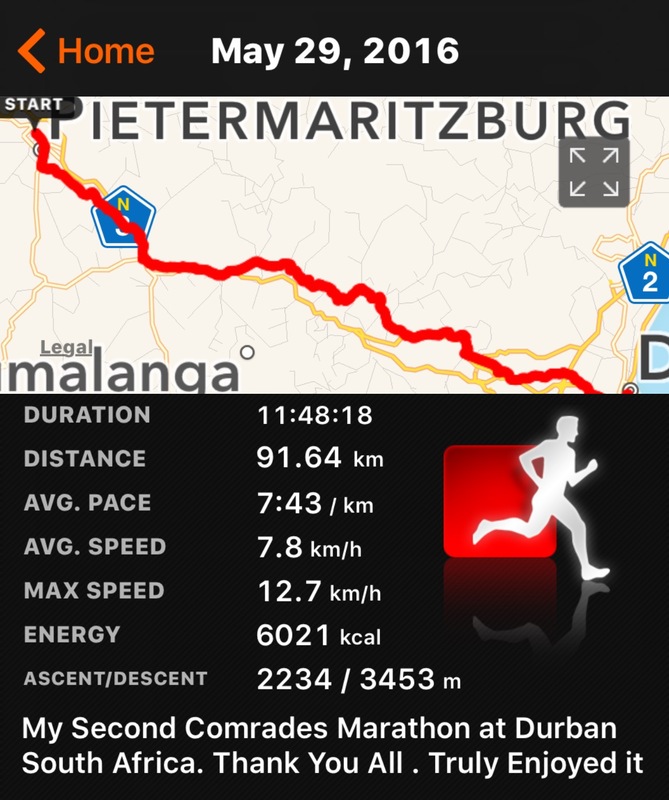 We started around 3:00 AM in the morning from Durban to Pietermaritzburg and had reached therearound 3:50 AM . So we had ample time . The weather was very chilled as expected & everyone was fully covered with full jacket or plastic covers & had hand gloves too . Excitement was at it's peak for everyone , as representing our country in an international event & that too so far for our country - Again a dream which many of us would never have dreamt of . Although we all are amateur runners & not professional , who are already engaged in several other professions in our lives & then also to take out time for Running , can only be possible by Gods Grace . To participate & be on the start line of an International Event where more than 20000 runners from more than 60 countries participate every year since last 91 years is a big-big thing . 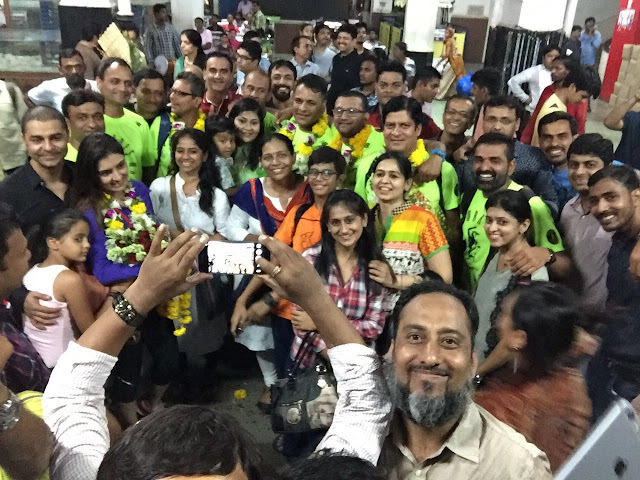 I was feeling very-very happy as last year I was all alone & this year there were in total 16 participants from our city of Surat – Indeed one of the Proudest Moment for All of us . 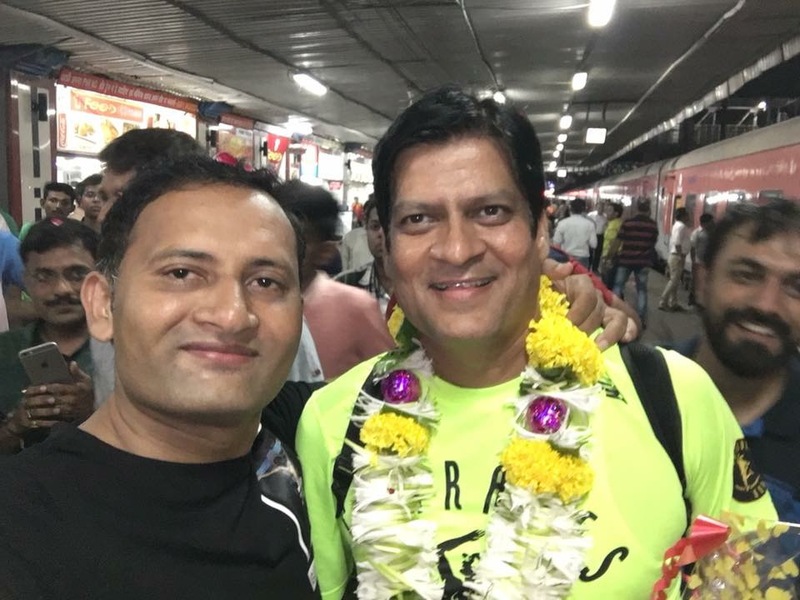 Even back home at Surat , all our well wishers just to encourage had participated from midnight to 6 AM in the morning by way of running , cycling , walking etc. according to IST & send us the good wishes in form of videos & photographs . Such is the spirit of Surtis . 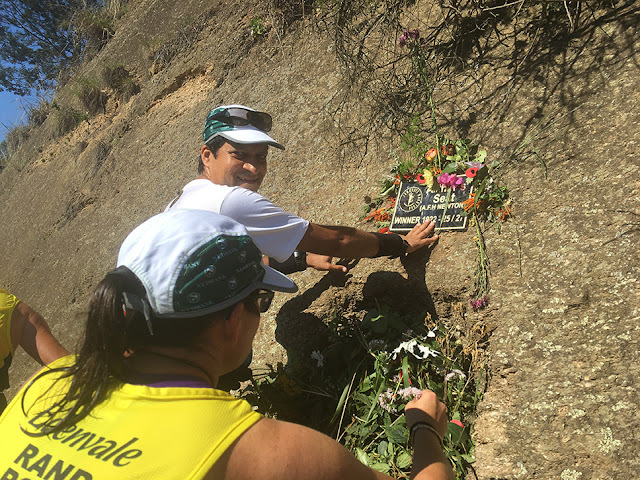 Never have ever heard of such a nice gesture just to motivate their friends who were miles away from home , made us feel that whether they were not present with us at that very time physically but were in spirits . Hats off & a Big Salute to all of them for this, as these are the precious moments which will remain throughout our lives. " Time is the most precious thing in Life which once spent cannot be earned back so we must always give full respect to those who gives us time as he or she has given the most precious thing which cannot be earned back . " We had a simple plan to maintain a speed of around 8.5 km per hour so that we would finish it in about 10:30 hrs . This was a doable task & on which we had mutually agreed upon. We must always keep some time in hands as if there are any unavoidable circumstances then we must have ample time to get out of it. As Ashishbhai is a very fast runner & he was in Group B he had a plan to run on his own . 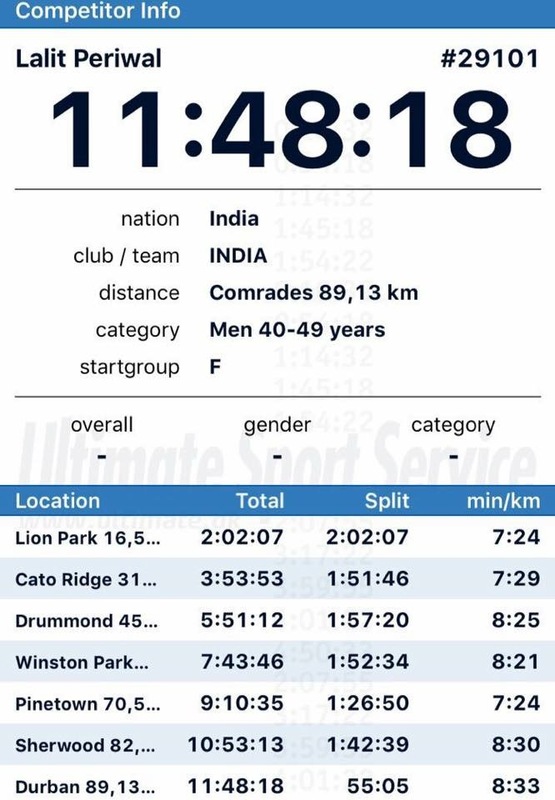 The Grouping in the Comrades are done according to the individuals finish time of a Full Marathon which has to be completed within 5 hours then only we can qualify to take part and this is to be qualified every year. Anilbhai ( G ) , Rajivbhai , Sureshbhai & Deepakbhai ( H ) were in other groups but Deepakbhai was lucky enough to sneak through in our Group ( F ) . Amitbhai Jaju , Preetyben Khurana were also in Group F . As this race is from Gun time to Gun time so the people think that the runners who are ahead have an advantage but I think that in a twelve hours race 10 minutes hardly matters but if you are a much slow runner & you have a bad day then seconds also matter , else we have to accept this challenge & be prepared for it every time we participate in Comrades . These are simple rules which every individual has to follow. We started well & the day before Satishbhai had told to run slow & easy in first half so were going according to that plan . I along with Dhruvbhai , Nipunbhai , Sarveshbhai , Rajivebhai & Deepakbhai were moving along well in the chilled weather . One more thing to share here that when we practice in toughest of conditions then it really becomes very easy & enjoyable when we get the favorable one . The crowd support is just amazing as usual & it has been the trademark of this event Since years . The cheering & applauding during the whole route just keeps us on our toes . People are selfless as they keep on cheering & applauding . 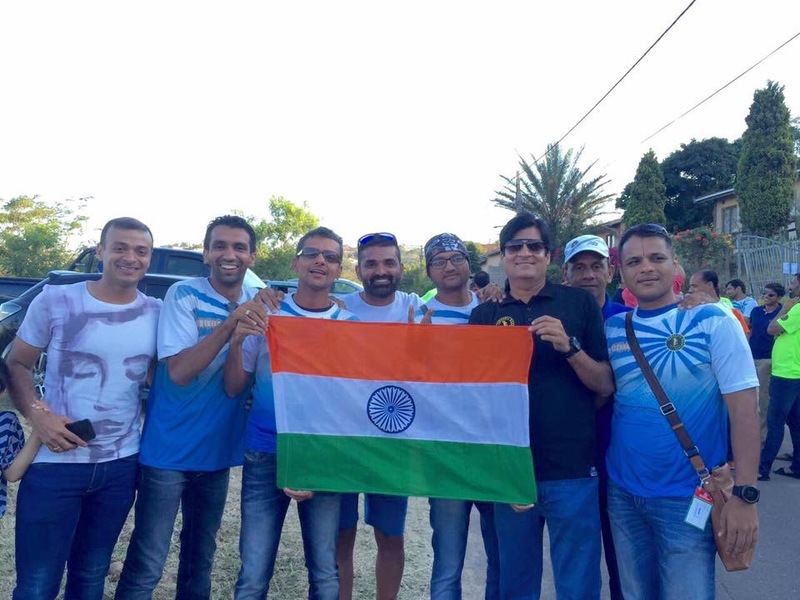 As we were running in the Team India T-shirt the slogan was more or less common throughout the route by the cheerful people who were waiting for their friends & relatives or had just come to encourage each & every participant who crossed them but for us it was " Come on India , Well Done , Keep Going . " Once more felt that running in the same T-shirt not only shows unity amongst us but we are easily traceable in the thousands . 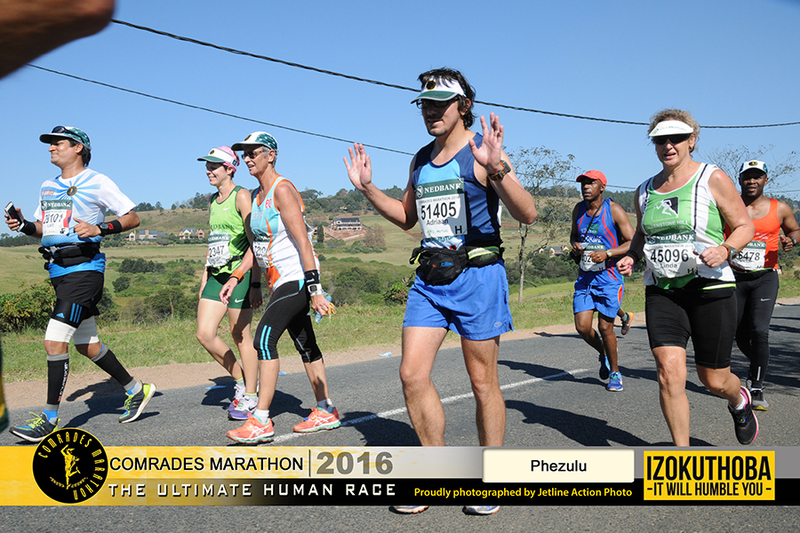 Even the people calling you with your name which is written on your Bib gives a feel that the person knows you . It is definitely a personalized feel as during running someone calls you & you immediately turn & see that who was there !!!! I had set 12 hourly alarms in my mobile starting from 5:25 AM then 6:30 AM , 7:30 AM & then accordingly till 5:30 PM to make it easy to be updated that this much time is completed . I had started my watch & sports tracker app 5 minutes in advance that is instead of 5:30 AM it was started at 5:25 AM just to keep ahead of the cut-off time & maintain a constant speed .
" Don’t watch the clock ; Do what it does. Just Keep Going . " Last year I was totally unaware & let me tell you all one more thing that I was about to miss the gate of 70.7 km at LION PARK by a whisker . Cut-off time was 9:30:00 hrs & I crossed this gate in 9:29:49 hrs luckily just by 11 seconds before the cut-off time last year . This I found out when I was comparing my 2015 & 2016 run . I had also kept the sheet of all cut-off on my mobile screen as favourites so it can be easily accessible . The first hour was very good as we had easily completed around 8.5 km in 1:01:27 hours & were approaching towards Polly Shortts . Enjoying each other's company we all were moving ahead. 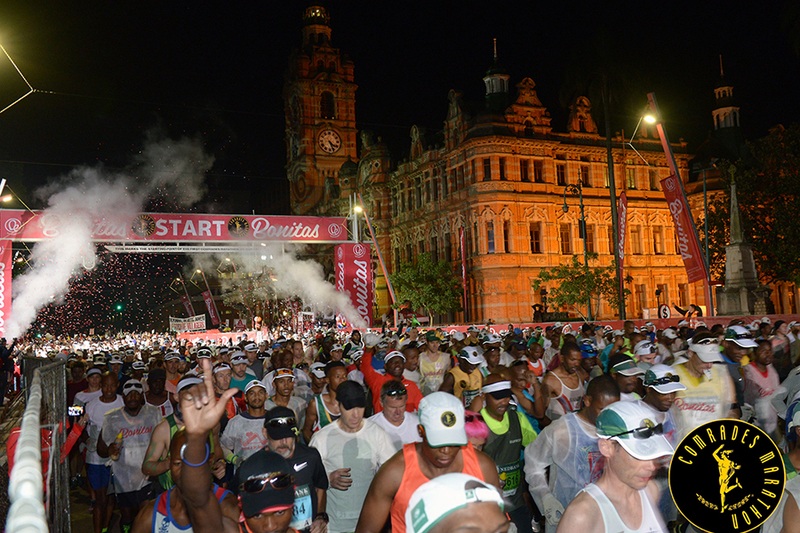 As there were more than 14000 runners running together it was looking as if there was a sea of people all around . When we used to see from bottom to top then from top to bottom it was all the same . We were to make way from this sea of runners but there was nothing to worry about as we knew that this will spread up after some time as the day progresses everyone will move ahead at his or her pace . As we were moving ahead we met an Indian couple whom Nipunbhai had met a day before & they too were very excited to meet us . It really gives a proud feeling when you meet your fellow countrymen in another country . After sometime Pranavbhai came running from the Group H . He was moving very fast & at a very good pace. We all greeted each other & he moved ahead . We were not in a hurry & were following the plan to conserve energy for the second half. We were not able to trace Dhruvbhai & Nipunbhai as they also had moved forward. So from the team of six we were four now . Then suddenly after sometime we saw that Deepakbhai was also not with us. Now we were reduced to a team of three. 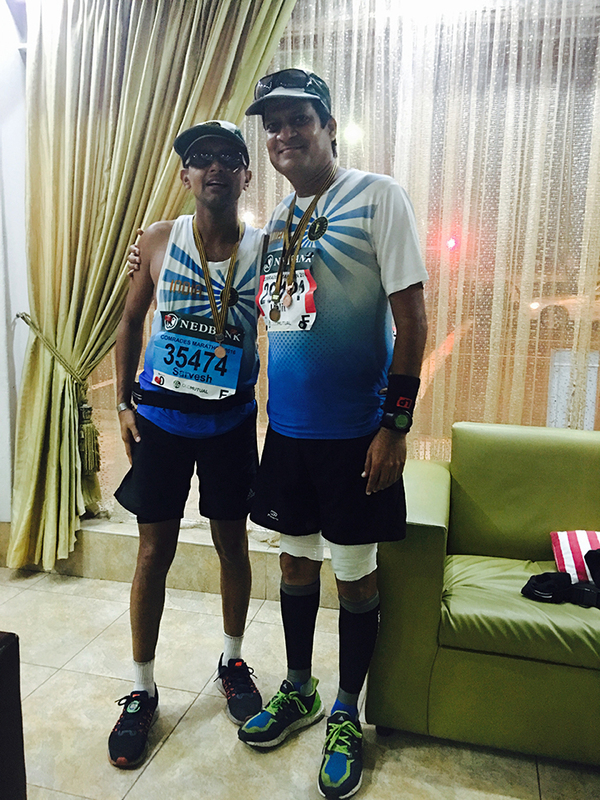 Rajivbhai Sheth also came from behind & we started running together . It was a pleasant surprise to see Rajivbhai at that time & it gave a very good feeling . We were nearing our First Cut-off at Lion Park of 2:40:00 hrs & the time of the day 8:10 AM . We crossed this in 02:02:07 hrs at 7:31:18 AM so we were ahead here by 0:38:42 minutes. Here now the average speed had dropped to 8.2 km per hour but energy level was on a high. As the atmosphere was chilled so I thought to continue just like that & had drank very less water . I felt later that this was a blunder mistake as it has nothing to do with weather & we must keep ourselves hydrated . Never be overconfident. We had completed first 21 km in 2:30:42 hrs which was perfect & we were bang on target . Rajivbhai Sheth had moved ahead . Now again we were a team of three . Suddenly Sarveshbhai started limping as he had pain in his calf then we stopped & he did some stretching & then again we started running . In Comrades or in general it is a principle that no one stops for anyone but how can we leave our friend in such a situation & move ahead . As the weather was still pleasant & so I was moving ahead in confidence that everything is fine & there was a feeling that there is no need to drink much water as I wasn’t feeling so thirsty . This thought of mine was going to be very suicidal in the later stage & I was totally unaware of it . 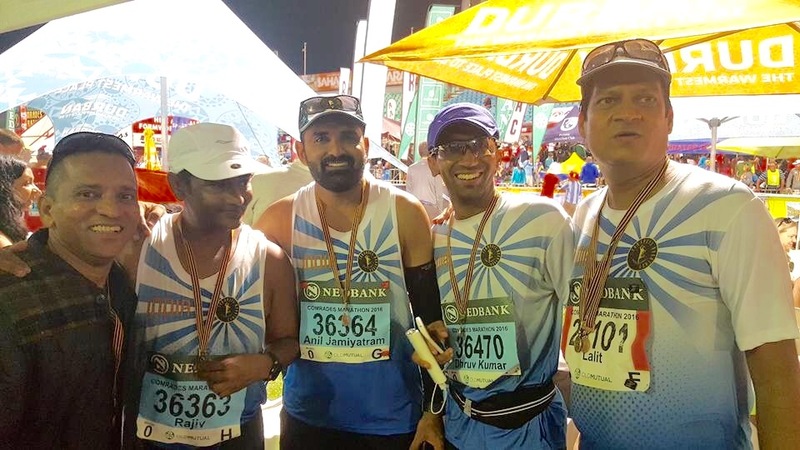 In practice also I generally drink 2 litres of water in running 21 km whether I feel thirsty or not but as we were coming by practicing in very hot & humid conditions my thought was that it was not required here. But never do this & always follow the same regime which you had done in all your practice runs. No new trials on the Race Day . We were nearing the second cut-off & crossed it in 3:53:53 hrs . The final cut-off time for this cut-off was 4:30:00 hrs so we were 0:37:07 minutes ahead . One thing is good for me as once the body gets set at a particular speed then it keeps on moving at it constantly or you can also say that there is a cruze control system . Like the last cut-off here also the same average speed of 8.12 km was maintained. So running at the same speed for nearly FOUR hours was a good sign . As from here , we had reached Harrison Flats , as it is said but there is nothing Flat here but the name gives us a good psychological feeling that atleast we will get some Flat surface to run at , where there will be no up & down . 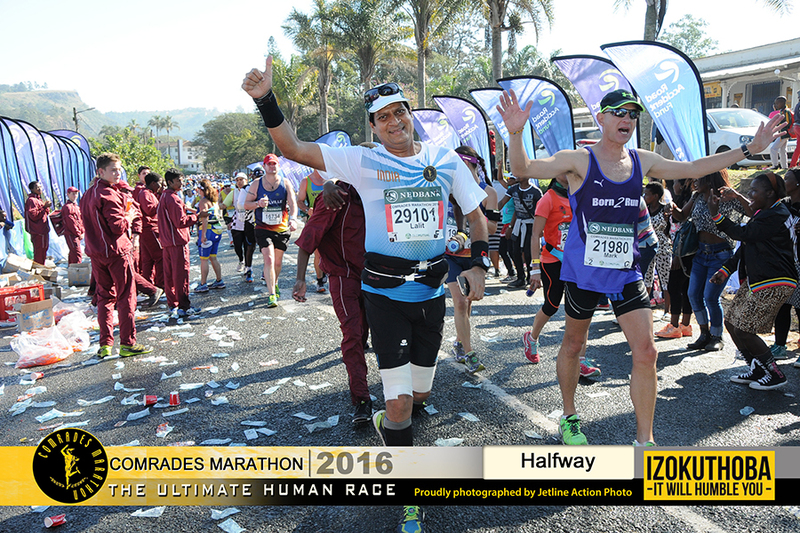 Comrades is all about the up & down going roads , the rolling hills & if we expect that here we will get some flat surface to run at , then forget it , as due to this only it is considered as – The Ultimate Human Race . 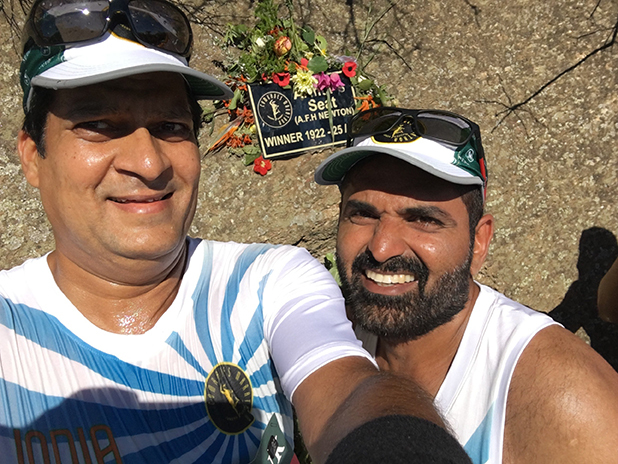 I along with Sarveshbhai & Rajivebhai was moving ahead maintaining the constant speed but as planned to run at 8.5 km Sarveshbhai being a fast runner was feeling a bit uneasy to run at this speed so after some time he moved ahead . As we are running in the sea of thousands of runners so once we miss the sight of a co-runner then it is nearly impossible to catch him . So from a starting Group of 5 we were now left with 2 only . I was going well in the company of Rajivebhai with whom I have ran my maximum km in professional events or in practice. We both were moving ahead smoothly in each others company . As we crossed the 37 km mark I remembered that last year on this very mark I had got cramps in both my legs . Now I was feeling very happy & was confident that as I had practiced a lot this year so the things will be smooth this time . But I was wrong as this was not to be. 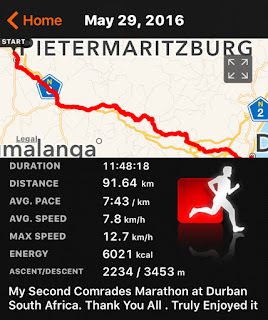 After 37 km crossed 38 , 39 , 40 , 41 & 42 km mark but as it is said that Law of Attraction prevails so again was in the similar position just like last year Comrades . 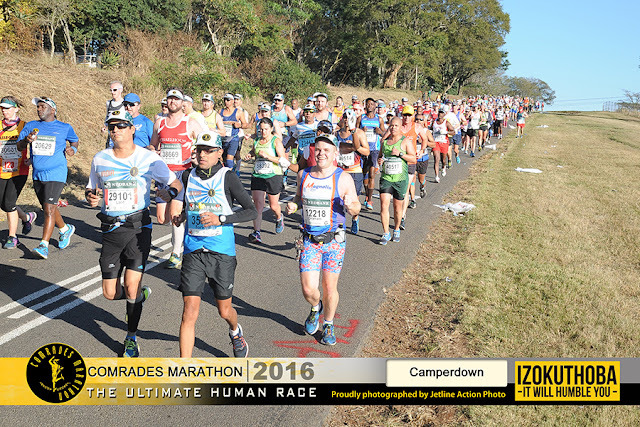 Perhaps “ COMRADES “ and “ CRAMPS “ have some “ CONNECTION “ with me . As since running more than 9000 km of “ INJURY FREE RUNNING “ twice had “ CRAMPS “ & both time at “ COMRADES “!!!!!!! . I told Rajivebhai it’s a long time & Anilbhai has not crossed us yet , it means he is still behind . It was just a thought in my mind which I shared . Then we stopped at the nearest medical station for getting bandage done on both my legs . Here also I remembered Shri Dilipbhai Patil who had guided me last year to get it bandaged when I had cramps last year . Again a big Thanks to him as today also I was in the same situation & his idea was working for me. As I was getting my bandage done then suddenly saw Anilbhai coming . Here the situation was just as if we are having a dinner & suddenly a friend comes then what we will say “ Come have it “ It was just like that . Anilbhai was also having the same problem & I told him you also get the bandage done . Time was running out. The time bound run is always like that & we get very less chance to relax & we have to keep on moving. After this we again started running but I told Rajivebhai to move ahead as still there was a chance to complete it in sub 11:00:00 hrs. . I told him you go I will come along with Anilbhai . So he moved ahead . So in my day to day life also I try to share whatever experience I have gained from running so that people don’t have to go through the pains from which I have gone . It will make life easier for them . In Hindi I would like to say “ जिस दर्द से मैं गुज़रा हूँ , मैं नहीं चाहता कि उस दर्द से कोई और गुज़रे “ . So I honestly share with everyone , whatever little bit knowledge I have known about running . In this type of situation the focus has to be diverted otherwise the focus just moves towards the pain only & we just think about Pain & Pain only. 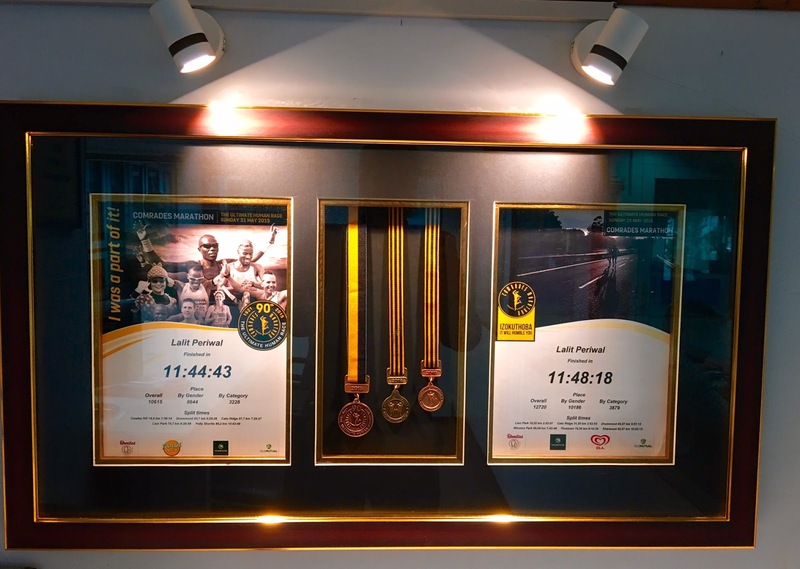 Anilbhai is an experienced runner who has trained more than 500 runners from the city of Surat but has only done a single Full Marathon at Mumbai & one Ultra Marathon of 54 km at Dudhani this year in January & February but has sincerely practiced with us long runs of 50 to 60 km . So divert his attention from pain I told him that as we cannot get the Bronze so let’s enjoy this event at it’s best . He too agreed upon this with a big smile on his face. We were nearing the " Aurthur Seat " at Outer West Durban - Drummond . The same Aurthur Baba which saved me last year & all the runners have full respect as pay homage at this very spot . I have faith that there is some magic here , as last year It was from " Nowhere " to have crossed the Finishline is due to some Blessings of this " Saint Aurthur " . I told Anilbhai let's get a photo clicked here . We had clicked individual photos & selfie here . Time was running & we were already lagging behind but wanted to make this run a memorable one so wouldn't have left this opportunity of being together & that too with a friend , as during a Comrades Run - which I had missed last year . Photos are the only thing which keeps you remind the whole story of that time whenever we see it in future & it definitely gives a smile on our faces when we remember it .
" One more thing - Person in the Photograph may Change but the Photo Never Changes . " From here onwards we had to stop at every water or aid station in search of Pain Relief Spray as Anilbhai was still in deep pain . He was repeatedly telling me to move ahead but in this type of situation if you get someone with you then the job becomes much easier . 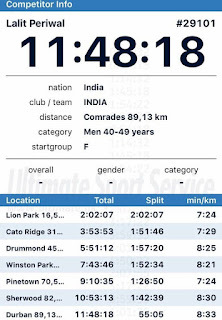 For any Marathon my theory is clear in this too , which I had shared many times before that there are only two type of finishers – Podium Finishers & Finishers but as here we were trying for Bronze in sub 11:00:00 hrs & that chapter was closed , so even if we finish in 11:59:59 hrs then also we are going to remain a finisher only. We were drinking water & coke alternately at every stations to keep ourselves hydrated . The blunder mistake which I did by not drinking much water in the beginning of this race resulted in having cramps but as everything happens for good so had I not got cramps I would not have been able to see a true fighter named “ Anilbhai Mandviwala “ who was just continuing on his self belief & firm determination to finish the race against all odds . One more lesson learnt here , that we must always keep bottles of Pain Reliever Spray with us during the run as who knows when we might need them . As spray was not available at every Aid Station . At one place where a group of people were sitting in their private tent waiting for their loved ones we requested them to give the spray . I told the lady “ Please Mam can you help us with it as My Friend is in deep pain .” She was kind enough & helped even though she was at a shortage at it and was waiting for her husband who was coming from behind. Thanks to that lady for providing with the assistance at that very moment. Last time I had completed the Full Race on Fig & Almonds plus Coke but this time we had Chikki , Fig, Roasted Almonds & Cashew , Dates , Mango Toffees as a variety tied in our waist pouch but were not finding it much tasty at that moment then also were having them from time to time to keep ourselves energized. We were also taking Salt tablets from time to time . Anilbhai was looking like a cute child at this very moment as he told “ सर बहुत देर हो गयी है | क्या करें एक salt tablet ले लेवें “ after sometime he used to say “ सर बहुत देर हो गयी है | क्या करें एक combiflam ले लेवें | “ I too always agreed & took with him like a true companion . I was trying to stay behind him as it becomes easier & here also it is psychological that someone is coming behind or the person who is running ahead has to keep on running by considering himself a leader . But the understanding was such that wherever we used to stop we stopped together & then run also together . Even during the Loo Breaks too we used to do the same thing . We were enjoying every moment of the race . 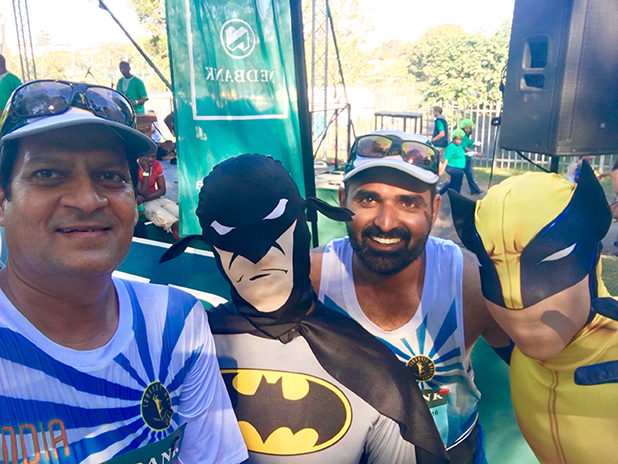 We were at Kloof where we saw the person dressed in Batman & other various character so we took a selfie with them too . Then we took selfies with the beautiful dancers over there . These are the moments but you have to be confident enough that even after spending so much of time for bandaging , walk run strategy , stopping at every station then also you will cross the finish line in time . As I told you that everything we were monitoring regularly & moving ahead accordingly. We crossed this in 7:43:46 hrs where the final cut-off time was 8:00:00 hrs means now we were 0:16:14 minutes ahead at this stage . So even after so many stoppages our running speed was good & we had covered time to increase the gap from cut-off time. Now the Sun was at it’s best here so the temperature has risen & it was totally reverse of what it was when the run had started . We were now pouring water on our head to keep the body temperature down. Just as I stopped at a water station then saw Shyambhai Latha a runner friend from from Mumbai moving ahead & this was his third attempt to finish a Comrades since last three years . I went running to him & told him “ Come on Shyambhai , Let’s go “ but he was very surprised to see me there at that very stage . He asked me “ How come you are here ? “ I told him “ Just like that & the situation is same like previous year . “ Then I again told him “ Let’s go “ but he replied “ You move ahead . I will catch up .“ Here again I did a mistake as would have forcefully took him with me then it would have been better but as Anilbhai had moved ahead & I had to be with him so I only requested Shyambhai . Had I applied a little push then the story would have been totally different for him . Later I came to know he missed this time too . I am extremely Sorry Shyambhai . 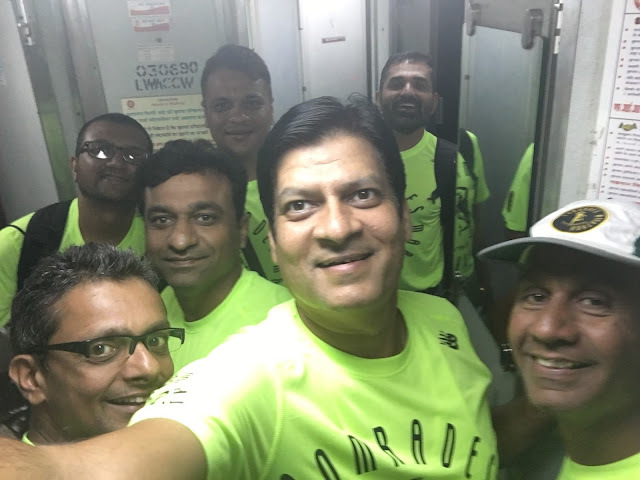 As we were moving from here onwards we were in anticipation that there will be down now & we had preserved a lot of energy by the way of walk run strategy that even after completing 68 km we were running at a speed of 12 to 12.4 km with bandages on both our legs . See what a good company does. Thank You Anilbhai as I was just following you. This Cut-off we crossed in 9:10:35 hrs for which the final cut-off time was 9:30:00 hrs so here also we were 0:19:25 minutes ahead of the cut-off time . The people were cheering & applauding from both sides of the road . Even the small children were there , some were serving wafer biscuits . We both had one & as a change it felt as if we had one of the best food at that very time . The crowd support here is awesome & this stage of the race definitely the cheering & applauding carries usto a new level. Hats off to the people who have been standing throughout the day just to cheer each & every runner passing through and whether they know them or not. But this was not to be , as again Anilbhai got a severe cramp & literally he was not able to walk even , at that stage . So from there they both told “ हम आगे जा रहे हैं “ . We said “ ठीक है आगे मिलते हैं “ | Then again Anilbhai did some stretching & we started walking slowly . After a few minutes through his will power he again started running & I was besides him . We both had crossed this cut-off together in same time by touching the timing matt together . Seeing his position now I was in no way to leave him ahead or back so thought that will have to be with him only. Strategy was simple . As he used to start running , I used to do so & when he used to walk , I too . 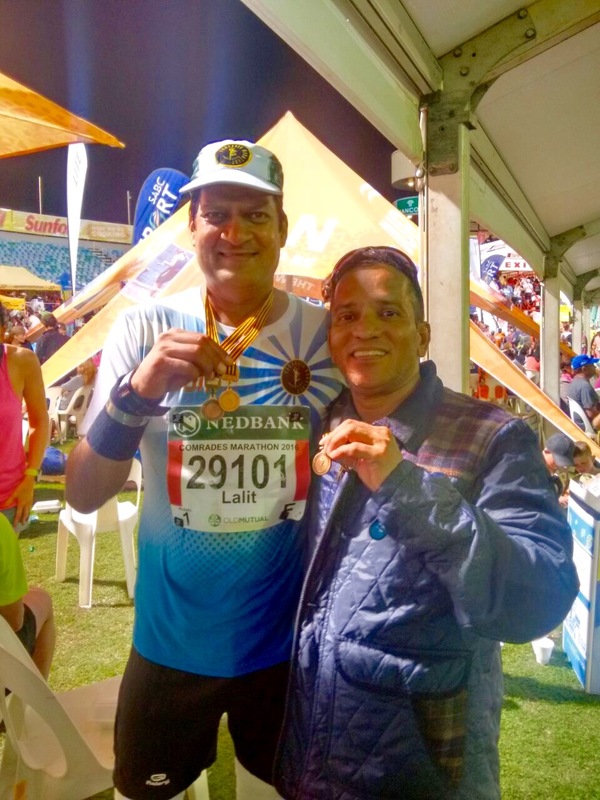 Then after sometime we found one more familiar face cheering & applauding the Indian runners - Dereck Shereeen Mahdoo , who stays in Durban & Satishbhai always stays at their house and Mr Dereck is the Guru of our Guru Satishbhai Gujaran . She asked , " Do you need something ? " I told " Yes ,I need Water " Then she gave me a water bottle & we moved ahead . 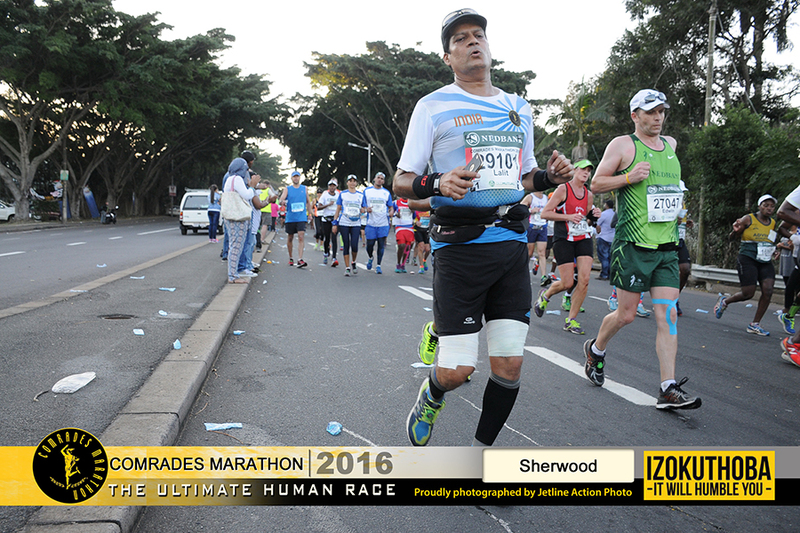 Thank a Lot " Shereen " as you had come to the Airport to receive us when we landed in Durban & then again you were here during the run . Meeting a known face during a Run definitely increases our energy level & boosts our confidence too . We crossed this tricky cut-off in 10:53:13 hrs where the final cut-off time was 11:10:00 hrs , so we were 00:16:47 minutes ahead here . I am saying this tricky as many miss out this cut-off after running for more than 11:00:00 hrs. 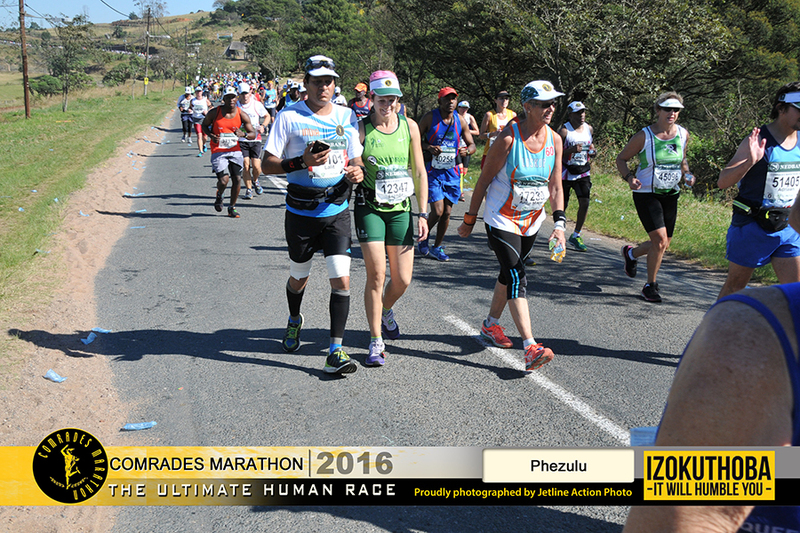 As we were approaching towards the Finish Point & the Final Cut-off , again we were able to see a huge sea of runners all around . As the finishing ratio is maximum in 11:30 to 11:59 hours but again we had to make the way from this . Here also there were Flyovers to be tackled . There was a gap of 1.5 km between what our watch showed and what the indicator board showed . But when we move a bit here & there to make way then our distance increases . Practically thinking we had 1:06:47 hours to cover the last 7 km . On any other given day it hardly would have taken only around 40 minutes to do so . But we both had never thought that we are running out of time or it will be neck to neck . Then again we saw Poojaben & Rahulbhai . As we crossed them Poojaben again told “ हो जाएगा ना !!! अभी भी चार किलोमीटर बाकी हैं “ I replied “ आराम से हो जाएगा | अपने पास time भी बहुत है | रुको मत .... दौड़ते रहो | “ They had held their nerves in this situation so were nearing to be part of a historic moment in ones life . Practice on tired legs definitely pays in this type of situation as I was running with Anilbhai at a speed of 10.4 km at 88 km whereas we were seeing people who were struggling to even walk . This too was in darkness and under the street lights of Durban . I was Thanking God that for this Comrades I got a friend for Life in the form of Anilbhai Mandviwala . His “ Never Say Die Attitude “ has taught me to be the strong in the toughest of situations. People only admire the one who completed at the top but who completes in total adverse situations has to be applauded more. 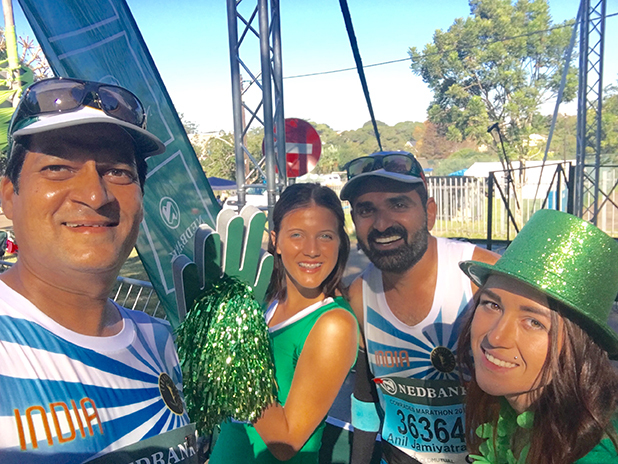 Now we had entered the Sahara Kingsmead Stadium & were searching for our friends in the stands & as discussed earlier that Manishaben Sheth will be with the Indian Flag & she would be handing the Flag to each one of us , so that everyone crosses the finish line with an Indian Flag in hand but this was not to be. This was only my second international event representing India and for Anilbhai it was a Maiden one . Now the excitement was at it’s best & it was giving a true feeling of achieving something extraordinary in totally adverse situation & that too with energy level at it’s best . The cheering & the clapping of the public from the stands made it more emotional . 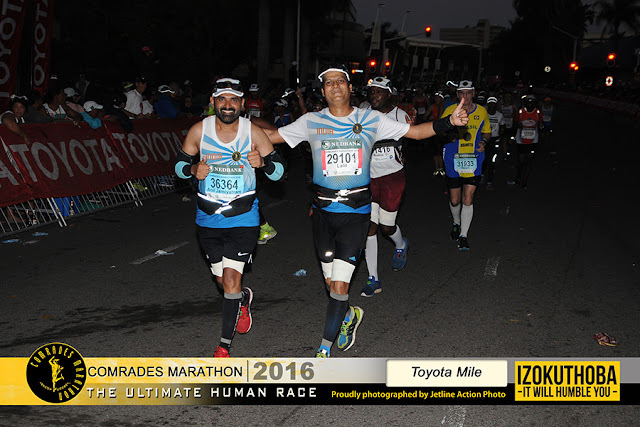 We both crossed the finish line with hand in hand and surprisingly our time & rankings were the same by finishing it in 11:48:18 hours , perhaps the almighty also wished that this Lifetime Memorable Moment where we both had not planned in advance but it was destined to be & as we ran together with each other so there was not a fraction of a difference in timings too. Truly unbelievable . After we had finished we were welcomed by runner friends from Mumbai who were waiting for their friends who were coming from behind . Kashyapbhai Modi with Avinshabhai Chandak etc. were waiting . 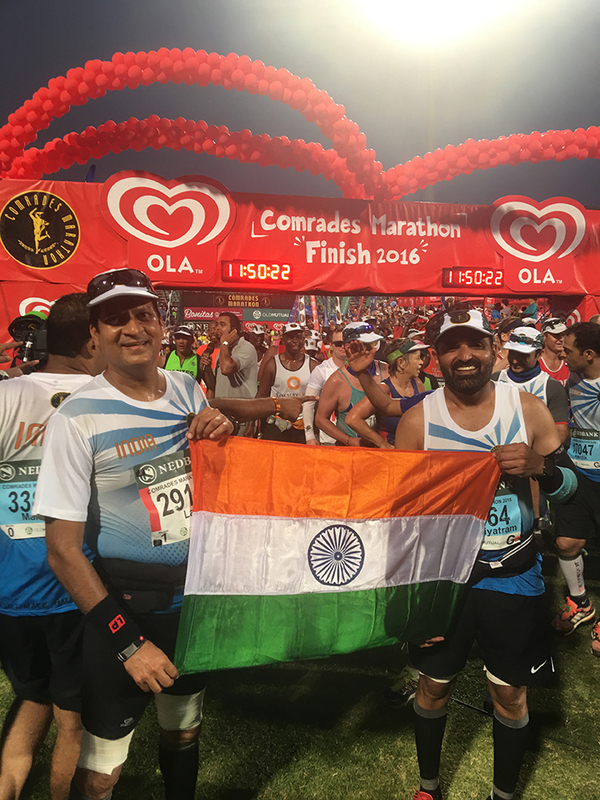 We Congratulated each other& then they handed us the Indian Flag which they had & told us to get a photograph clicked with it. It was an awesome feeling . My last year Comrades Finishing partner Vivekbhai Singhal was also present there . I got a photograph clicked with him too . Then we moved on to receive our Medals . Rahulbhai & Poojaben also finished in 11:50:07 hrs. We Congratulated each other . Indeed it was a superb performance from both of them too . As they both are very good runners & are mentors to many in Surat so this performance of their will inspire many to do Comrades in future . 1. My Parents - Had you not brought me up in a healthier way & also directed me to live a disciplined healthy lifestyle this would have been totally impossible to have achieved at this age . An age when most people like to play safe . I am Thankful to My Brothers , Sisters, Nephews , Niece & All My Family Members who have always appreciated & applauded all My Achievements . 2. My Wife & My Children - First of all my wife adopted & started running just for me after I suddenly announced ( Without discussing with her ) at the felicitation program of my Successfully finishing Comrades 2015 that she will run a Half Marathon at Hyderabad in August 2015 . Since then she participated & completed 6 Official Half Marathons in 7 months of running . My Children have also been a powerful force as whenever we have been out of Surat for Marathon they have adjusted accordingly & even during the weekends or week days they have always made me stronger & not weak by adjusting here too . 3. Mrs & Mr Rakeshbhai Gandhi - You are an excellent gift provided to me by God who has always shown me to be on the right path & just to follow the dreams . You may not be in the picture but your unconditional support has made me reach & achieve any target . I feel proud in saying that even the closest of blood relation would not have made me so comfortable as you do . 4. Satishbhai Gujaran - I really feel short of words to express my feelings for you as even after achieving so much in Life you are so humble - A lesson to be learnt . Always helpful in whichever & whatever way you can to promote Running . Respected Sir , people will remember till ages , your 284 km run from Mumbai to Surat last year in September 2015 in three days . Your humbleness is always at the best as after finishing in 9:55 hours you had waited for everyone just to welcome & congratulate everyone. 5. Ashishbhai Kapadiya - Another gem of a person whom was able to meet only due to running . 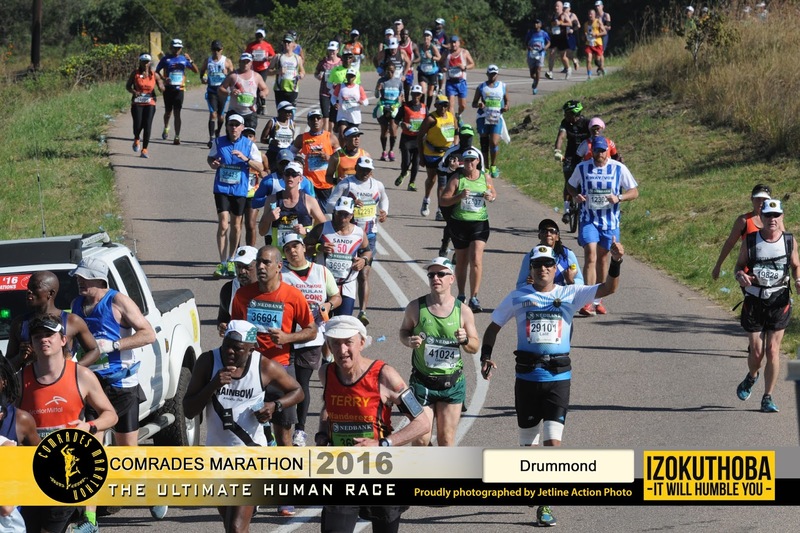 My single call to you to register for Comrades & you registered and came along with us . You are a master in whatever you do . This was your First International Event but as usual you came out with flying colors as expected in totally adverse & tough situation on that day. Wishing you All the Best for many more future International Events . ऊँचाईयों पर होती है चारों तरफ से वाह-वाह होती रहती है | "
7. 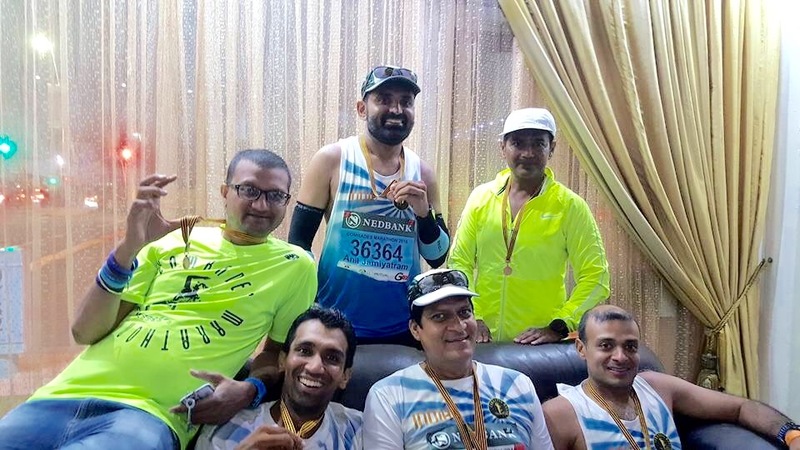 Rajivbhai Sheth - A master of maximum number of Half Marathons from the city of Surat who started running 42 km since last 6 months & turned into an ultra distance runner & now a strong Comrades Finisher . Yours was an extraordinary superlative performance with one of the strongest finish which proved that age is just a number . My Best Wishes are always with you, so Just keep going & doing further international events to inspire more & more people .
" अपनी शक्ति पर भरोसा करनेवाला कभी असफल नहीं होता | "
" If you quit once it becomes a habit . NEVER QUIT . " but am sure if I would have been in such a situation then would have to return back from there . अपनी नौका के पाल की दिशा ज़रूर बदल सकते हैं | "
9. Sarveshbhai Gupta - I really missed your company in the last years Comrades & had wished that we would finish together but am extremely sorry that I was not able to match & maintain your speed . No regrets but had you & Rajivebhai would have finished within 10:59:59 hrs then it would have given me immense satisfaction. You too are an honest person as you had told me when we met after completion , that if you had completed in 11:33 hours how come we are going to reach before 12:00 hours cut off . I am Thankful to you too that you registered & we had spend the best of time together . Wishing you all the Best for your future events . 10. 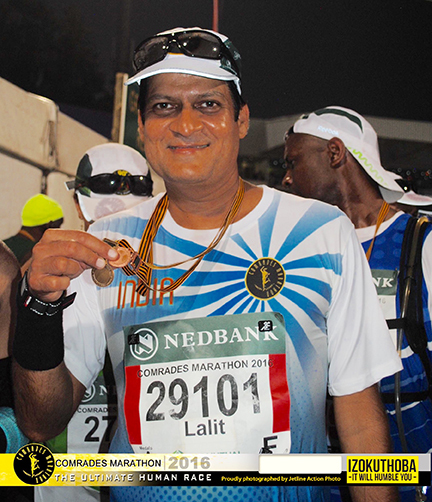 Rajivebhai Valadra - A person with whom I have ran the maximum distance out of the 9000 km I have ran till Comrades . 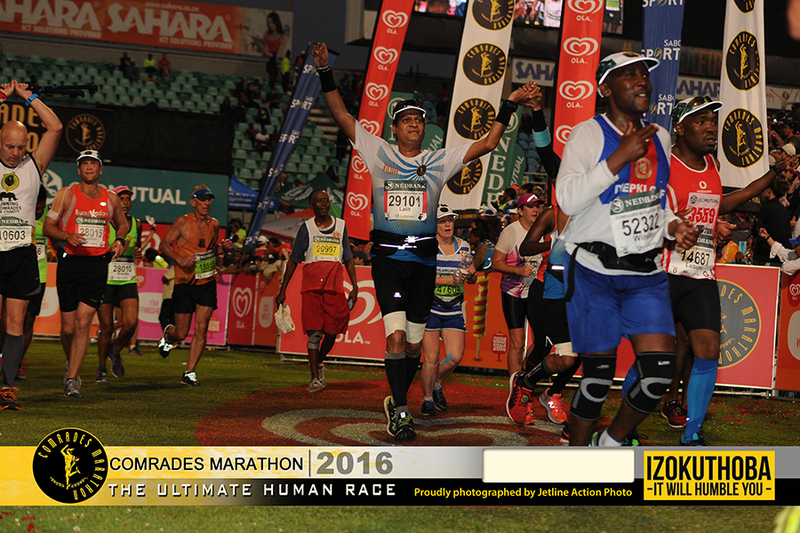 Thank You that you too registered & crossed the finish line at ease . Yes , we were together till 42 km mark & I had told you to move ahead & you moved on . With you I have ran the maximum number of kilometers & would have loved to cross the finish line together but this time perhaps this was not to be . 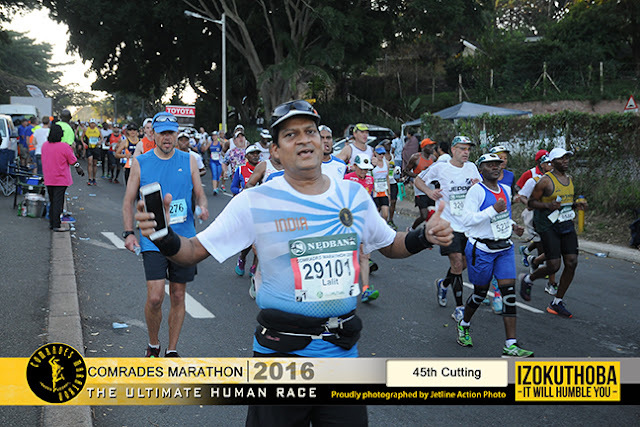 Hoping that everything goes fine & we cross the finishing line at Comrades together in future . 12. 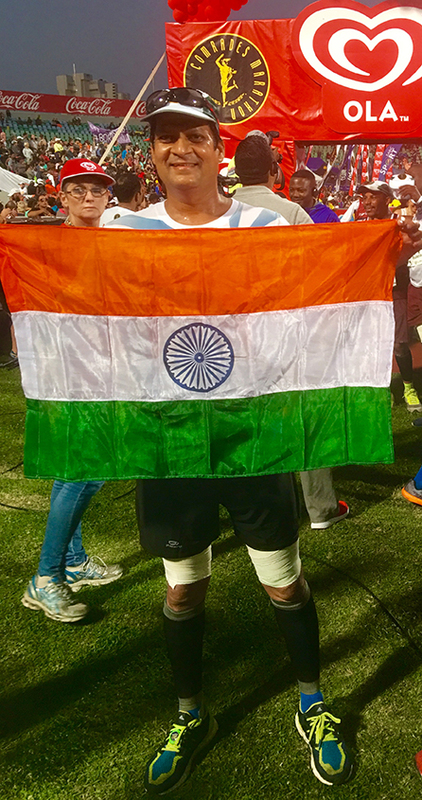 Deepakbhai Mundra – You too had come with an injury but had it been your day then the result would have been totally different . You missed the cut-off by a few minutes . 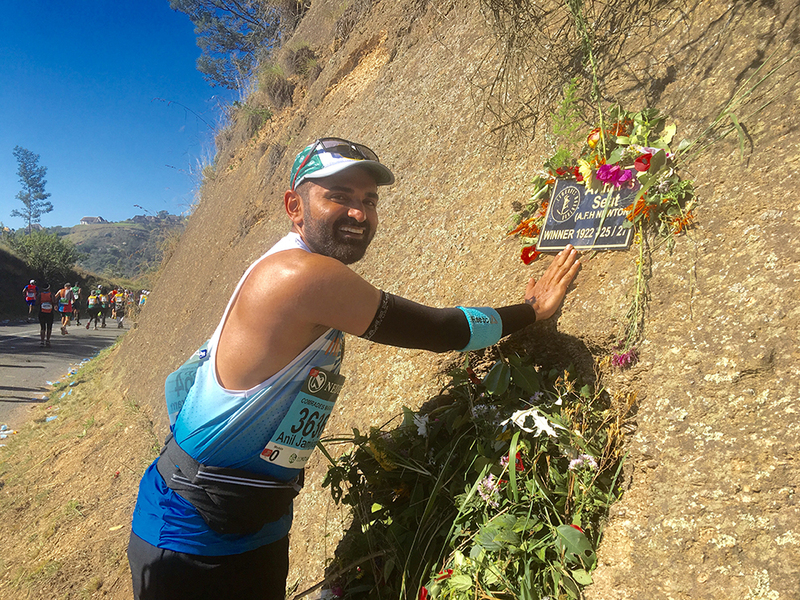 Perhaps it was not Your Day & you again got hit on the same spot where you already had injury thus making it difficult for you to carry on but completing 72 km in this type of situation is also a Superb Achievement . I know you too are a strong character so you will come back next time more strongly . My good wishes are always with you . I wish that whenever we do Comrades next time we will come with more strength , power & preparations . Wishing you All the Best for Future Runs . 14. 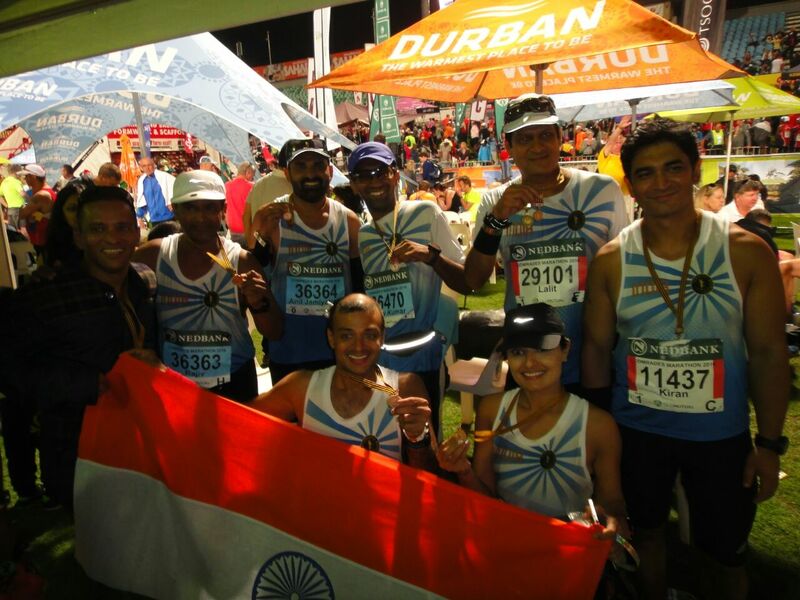 All the Members of Run for Unity , Speed Racers & All Other Participants who participated in the Night Run Wishing us Good Luck – The Best wishes of you all in presence , in the Good Wishes Book , when you all came to the Railway Station when we were going to Durban & when we returned back from Durban has helped us to complete this run successfully . It is just about unconditional bonding which we all share . Thanking You All without naming anyone in particular from the bottom of My Heart . 15. My Dynamic Family Members – Each & every member here , has played a very supportive role in all my achievements as their good wishes have been always with me . They have always watched very closely both my Comrades Run & have always appreciated all my achievements . Indeed I am Thankful to all of them too . It is a very inspirational source for runners community.. Thank you Lalit Bhai for your valuable guidance through your comrades experience.. I lost into the story right from the word go! As usual, you have a knack of graphic description , and everything was put forth before our eyes ! ( the photographs attached did not open. But it did not matter !) Your story will inspire all of us to participate comrades at least once in life, without which, it will not be considered as complete ! Salute to your spirit, your comrade rise, and writing style ! It will always be a joy to run along with you in surat !